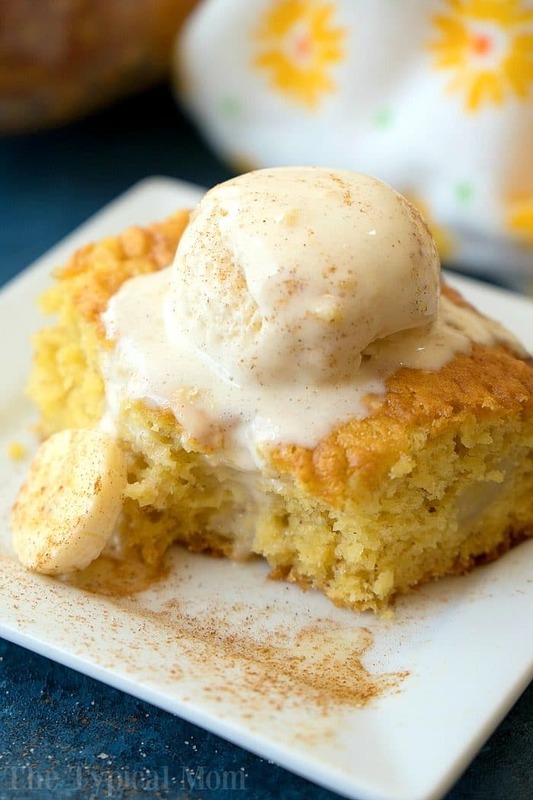 The best banana pudding cake you’ll ever make! Loaded with ripe bananas and a touch of cinnamon this easy cake turns out moist and delicious every time. Ok so I do cook and bake things from scratch using my overripe bananas like my sour cream blueberry banana muffins that are just amazing, but when I’m in a hurry a doctored up cake mix like this is just as fabulous. The key to baking this banana pudding cake is to NOT over bake it! I leave it in for 35 minutes which makes it beautiful and puffy when you take it out, and with time it will deflate a little to look like this because it is so moist inside. 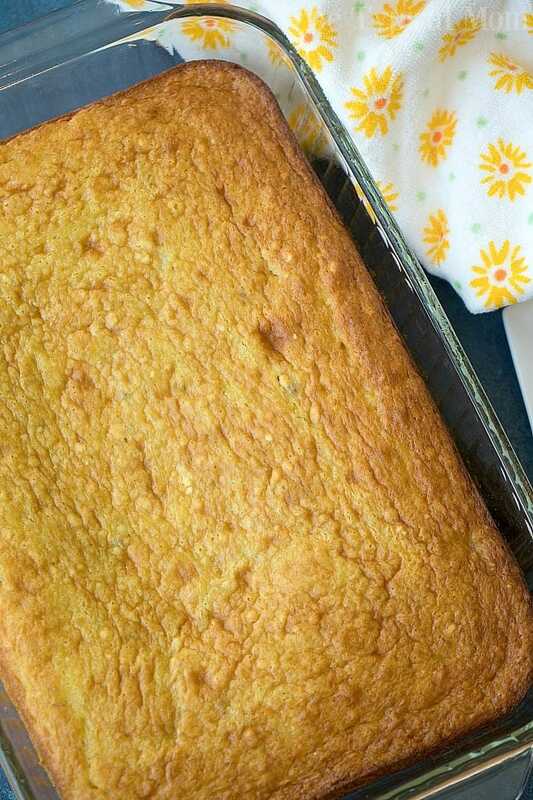 The edges on this banana pudding cake are semi firm like a “normal cake” to the touch but the center is much softer. It will continue to bake though in the pan as it is cooling so you don’t want to wait until the whole thing is semi firm or else if you allow it to cool it will lose a lot of that moist texture, and some of the bold banana flavor. At the end of the day I kid you not it is such a wonderful flavor. Even serving it as is it has a lot of flavor and sweetness and doesn’t really need anything else. Adding a bit of vanilla ice cream on the top though is pretty incredible….and filling so you don’t need a big slice. I guarantee if you love bananas and bring this to someone’s house they will rave about it too (and they won’t have any idea just how easy it is to make). And of course you can’t forget to make delicious banana bread for breakfast with your overripe bananas. Like I said, do NOT get rid of those brown bananas. There are SO many delicious breakfast and desserts you can make with them. I love using overripe bananas in recipes because they have a natural sweetness to them so you can add less sugar and it’s plenty. Try this one first and then come back to try another one above. If you aren’t quite ready to bake but yours are turning a bit too brown then throw them into the freezer in a bag. Once you’re ready leave them on the counter for a bit to thaw out or put in the fridge overnight. It is important to put them into a baggie first though because once they start to thaw out they will ooze a bit of liquid and you don’t want that getting everywhere because it’s a bit sticky. 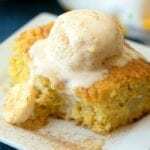 The best banana pudding cake you'll ever make! Loaded with ripe bananas and a touch of cinnamon this easy cake turns out moist and delicious every time. Mash your two very ripe bananas. Add in your cake mix, instant banana pudding mix, oil, eggs, 1 tsp of your cinnamon/sugar mixture, and water. Use a mixer on low to mix until fairly smooth (there will be lumps from the banana. Use a knife and slice your yellow (pretty firm) banana into your cake mixture and gently fold them in with a spoon. Spray a 9x13" pan with non stick spray and pour your cake mix inside. Smooth out so it is evenly distributed. Put in the oven at 350 degrees for 35 minutes, do NOT overcook. Take out and put on a cooling rack until completely cool (will continue to cook and solidify in pan while cooling). Slice and top with some vanilla ice cream and sprinkle of cinnamon/sugar mixture. What would it be if you were to convert the 3 ripe bananas into cup measurement? 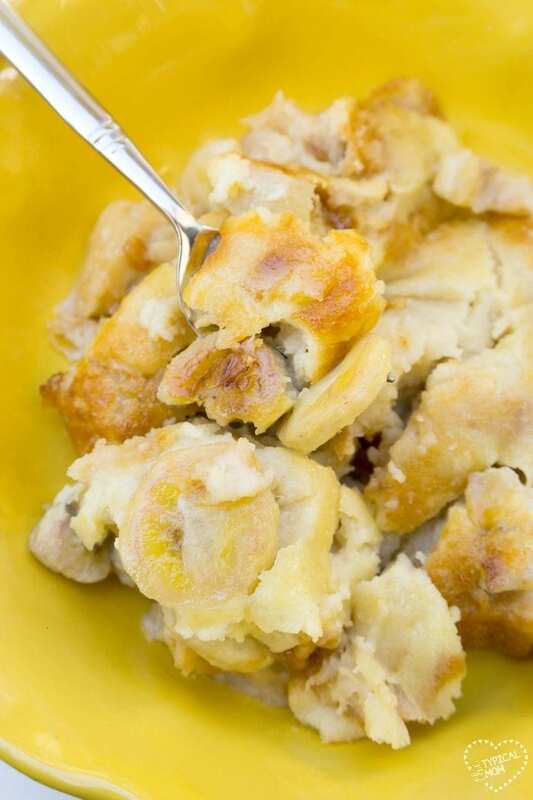 I mash & freeze my overripe bananas for later use when baking is more convenient.